First and foremost, happy New Year! This is my favorite recipe. It’s the one I make the most, the one I could make in my sleep, if I had a predisposition toward somnambulant baking. It’s an art. A thing the body knows. But it isn’t hard. And it doesn’t take long. And with these biscuits you can break hearts and best foes and bend the fabric of space time to allow yourself to live all the parallel lives you feel you’re missing out on. I may be overstating their abilities. But I might not. You’ll probably just need to make them and mull over their potentiality with a cup of tea or coffee. It’s New Years day today. Well, actually it’s about 2 AM on New Years Eve. I didn’t celebrate. Unless you count making & eating a biscuit with ham, working, being undefeated at Clue like a diabolical genius, and transcribing some fevered facsimile of one of those parallel universes these biscuits may or may not have the ability to open a wormhole to. You know, partying. The past year has been nothing short of confounding, brilliant in its utter & complete unknowability prior to the fact. The people that entered my life, returned to my life, the various forms they morphed into, the stories I’ve gotten to live. I couldn’t have called any of it if I’d tried. I’ve always admitted that if living has taught me much of anything it’s taught me that I’m no soothsayer. My ability to predict the future is nil. And that’s wonderful. Each time I think my story is written in stone, I get to learn it isn’t all over again. It’s terrifying. It’s keeps my blood pumping. My intention for this year is to not tell it what it’s going to be. And to keep doing my best with what I’ve got when I’ve got it. Because ultimately when it comes to my creative work & life as lived thus far—from the things I’m most ashamed of to the things I’m most proud of—I don’t know that I would change any of it. I like a diverse narrative, what can I say. And ultimately, winding as it may be, I always end up where I’m supposed to be. The day after tomorrow I leave for Italy to teach a workshop in Venice. Venice is the first city I ever traveled to in Europe when I was 15 years old. For a brief Scarlet Pimpernel fueled moment I thought I was terribly in love one night in those streets. I even wept for the stranger that night. About a month later he would write me an email that lamented “God save American girls!” Almost ten years later, I went there again on my star-crossed honeymoon. I’ve written stories on top of stories there, and I look forward to writing more. I’m looking forward to the change of pace, the work, my friends both known & to be met. I bought rain boots. I’m inordinately excited about them. I’ll be a bit off the grid, but I’ll be sharing my travels on instagram if you’d like to follow along. Wishing you all ease & peace this year. And if not that, then then may it be a fire that consumes you only to birth you anew. Phoenix like. Those sorts of years are good too, in their way. There’s nothing quite so transcendent as being destroyed so you can become more than the sum of your shattered parts. Easy to say, harder in the moment. But no less true. 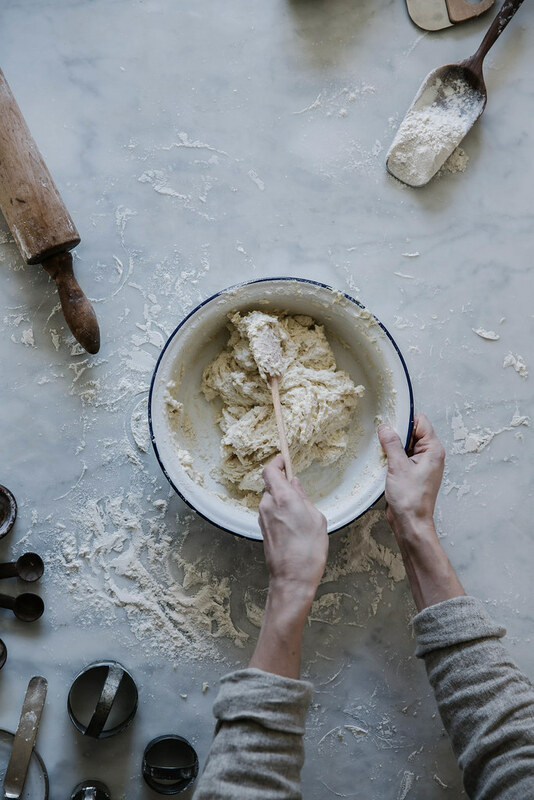 Using your fingers cut the butter into the flour mixture until it's just crumbled and no pieces larger than a pea remain. Pour in the buttermilk. Stir just until all the dry bits are incorporated, no longer. It should be sticky and shaggy. Not dry. Not wet. Sometimes humidity can affect this. 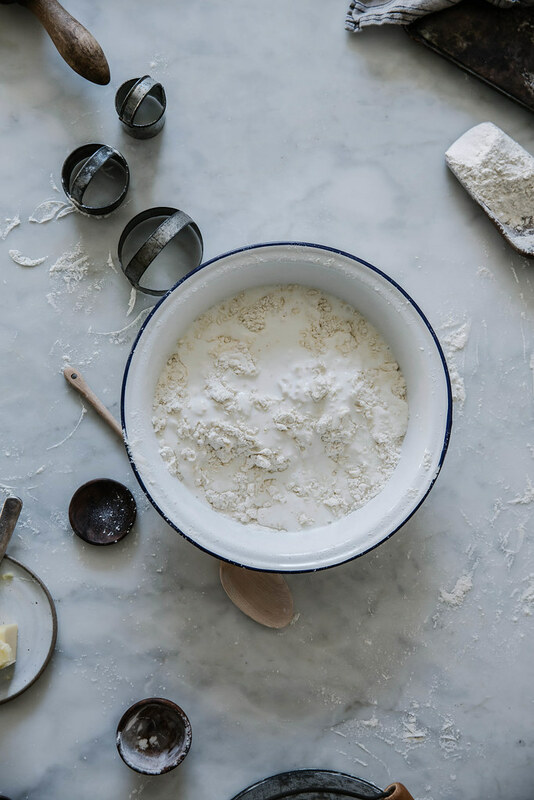 You'll get used to your dough and know when to add a splash extra or flour your surface a little more heavily. Biscuits are an art, not a science. Okay, they're largely a science. But science is art. I digress. Lightly flour a work surface and turn your dough out onto it. 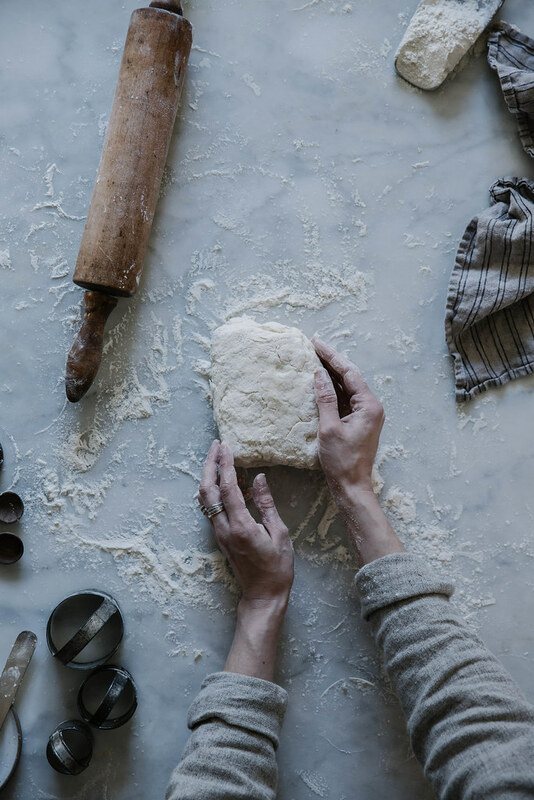 Lightly flour the top of your dough and use your hands to pat it out into a rectangle a little over an inch thick. 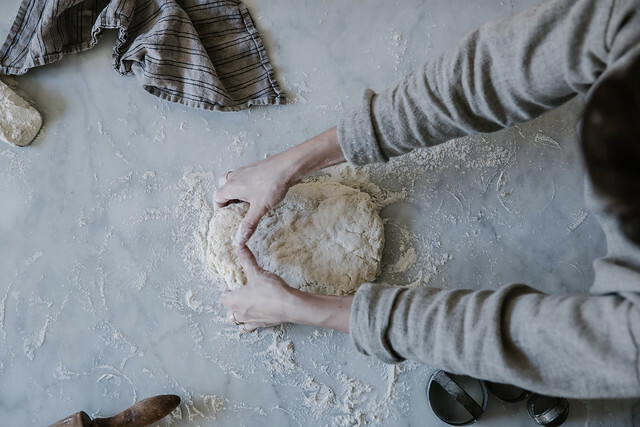 Fold that rectangle toward you, rotate the dough counter clockwise, roll it out gently using a wooden rolling pin. 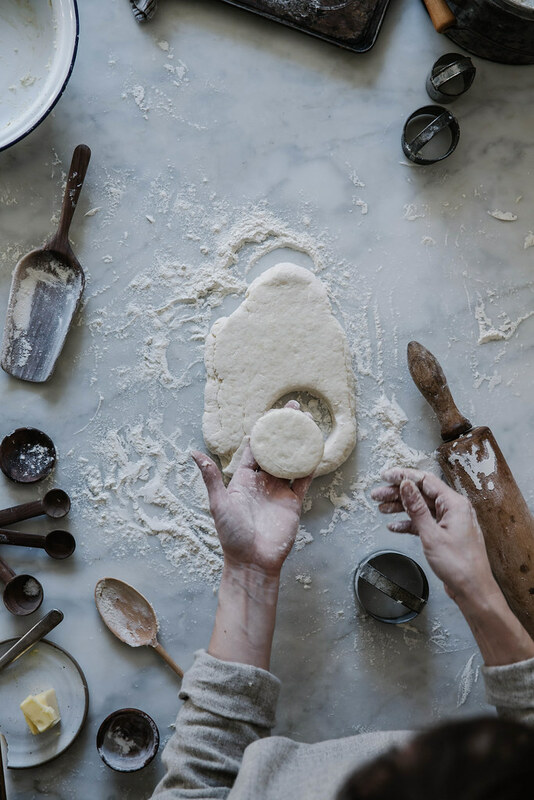 Use a "bouncing" motion from the center of the dough, careful to not crush the outer edges and destroy your layers. It's important to roll very gently. Repeat the folding and rolling two more times. Sometimes I add an extra fold if I'm feeling extra foldy. Roll the dough out to about an inch thick and using a floured biscuit cutter, cut your biscuits (be sure to not twist your cutter, it will seal the edges and they won't rise as well, gently gathering and re-rolling the scraps until the dough is used up, placing the cut biscuits touching one another on a lightly greased baking sheet (they will help each other rise, that's why you want them touching. . But I'm not gonna light, I don't bother to grease mine. I also don't brush them with anything. I like them simple, simple. Bake for 10-15 minutes depending on the size of your biscuits, the weather, and your oven. They should be golden brown and fluffily cooked through. Enjoy warm with all manner or honey, sausage, jams, ham, and, of course, good butter. Congrats, Ms. Beth, for the nod from G&G. So glad for you! I agree with Joanna. 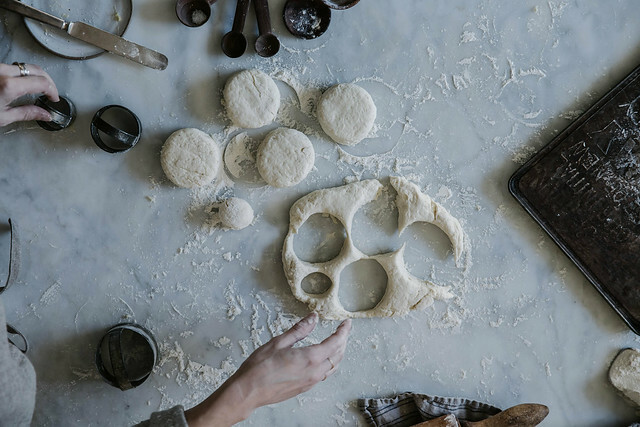 Due to the simplicity even I feel like I can make these biscuits! 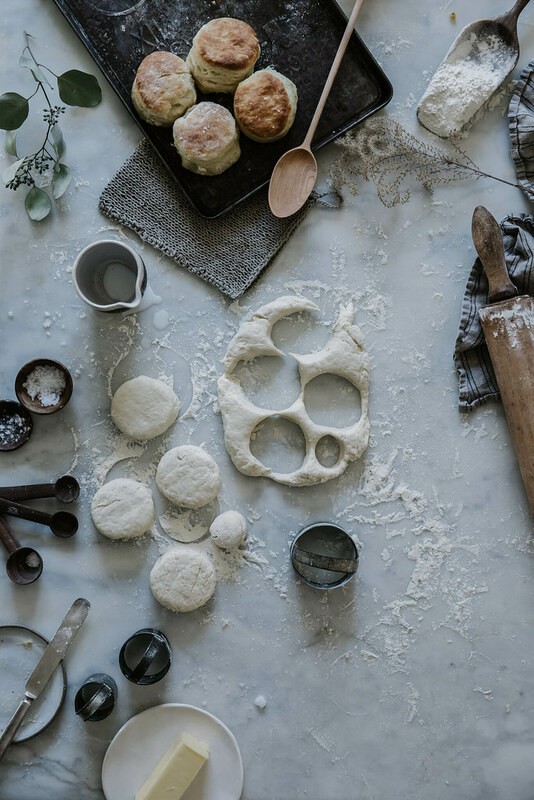 These look so good I feel might have to tackle my fear of dough and just make a batch. Unlike you, I am pretty much of a soothsayer concerning my own immediate future, and usually by September I already know what the next year will be like, give or take. And so I never wish for NYE, as I am aware of most of what lays ahead waiting for me, and usually, most of it is not something I want to live through, again and again – somethings are really way out of our hands and our ability to control and change them, no matter what self help books and gurus might say. THis year I have made the resolution of not dwelling on the year ahead by September, or October, November, even by December. Whenever my mind entered that realm of what the future will be like in 2015, I shut it down. Hard. I do’t want to know, I don’t want to be prepared. Even if it’s all bad things. Let them take me by surprise, if need be, let them rip me open as they will. Let me be unaware, and innocent as a babe for what lies ahead, is what I beg. It may be harder, but it may be easier. I wouldn’t know, I have never tried it. And one of the things I look forward to, vicariously living as I like to do, is this Venice workshop and travels of yours through instagram. Cannot wait to see the city through your eyes. Happy new year, Beth, may it be as grand as the last one for you, and may you keep inspiring so many of us. Loved this post. 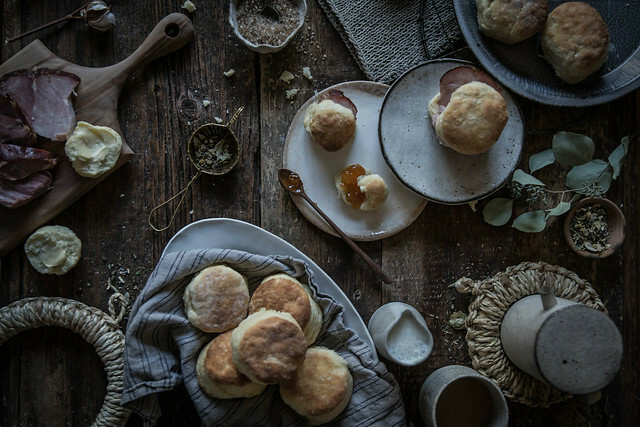 Biscuits were one of the first things I made as a young wife and I made them every morning before I went to work. I thought a good wife made good biscuits. Of course this was 42 years ago and I lived in the country. I still like to make and eat biscuits. They are so southern and comforting. Happy New Year to you, Beth and I wish you continuing happiness and prosperity. Wishing you happiness! 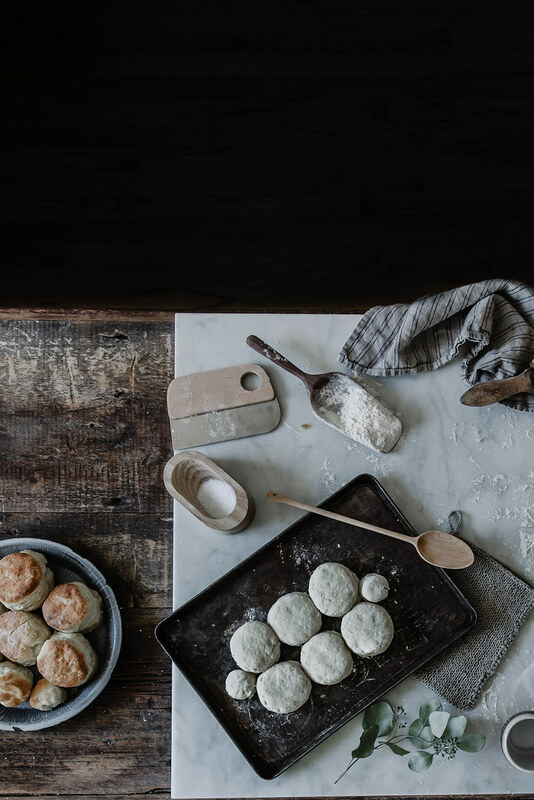 These buttermilk biscuits look fabulous! These pictures make me incredibly happy. I can’t put my finger on it – they’re just delightful. Thank you for sharing, Beth. Happiest of New Years to you! I think I’ll make these today! I have all the ingredients and my now deceased father-in-law always insisted that the first ‘meal’ of the New Year be pork… via an animal that ‘roots-forward’ (versus chicken that scratches back). Silly I suppose?! But, as you suggest, they’ll go nicely w/ham!! Happy and safe travels to Italy! Best in 2015! Also Venice, amazing! I have never been out of the US but Italy is on my top list of places to go!! These look absolutely delicious! And I an always blown away by your photography, it is just so simple, elegant and unique! It has a rustic vibe that just makes the food look so cozy and homestyle. These biscuits will definitely be part of my next brunch! I hope you have a wonderful 2015!! Wishing you safe travelles and a year of wonderful moments! the photo third from the bottom with those two petite biscuits makes my heart smile wide. I’m making these as we speak. I have tried many a recipes seeking a genuinely good biscuit. I have grown fond of another biscuit recipe you have, the one included with the jalapeño cornbread stuffing – a household favorite of ours now. I do hope to see a book of your collective recipes some day soon. Cheers to a new year, friend! have you ever considered to teach an online workshop? Though you also teach abroad, which is great for us international readers, I, however, just could not afford to participate which might be the case for others as well. So an e-class of some sort would greatly be appreciated. oh I’m so agreeing with Mia on this one, as much as I would simply looove to attend one of your european workshops – this one you’re doing now in Venice with the lovely Skye is certain to be a dream – I simply cannot afford to, much to my chagrin. So an online workshop, course, would be so lovely!! I recently took one with Marte Mari Forsberg and another one with Leela Cyd and both were really great. Of course it is not the same as a live one, but perhaps it would be a tiny sample of what the real thing is!! I’m also sharing your view that I refuse to tell the new year how it’s going to be… I refuse to make resolutions or follow expectation, rather I promise to just take each day one step at a day. 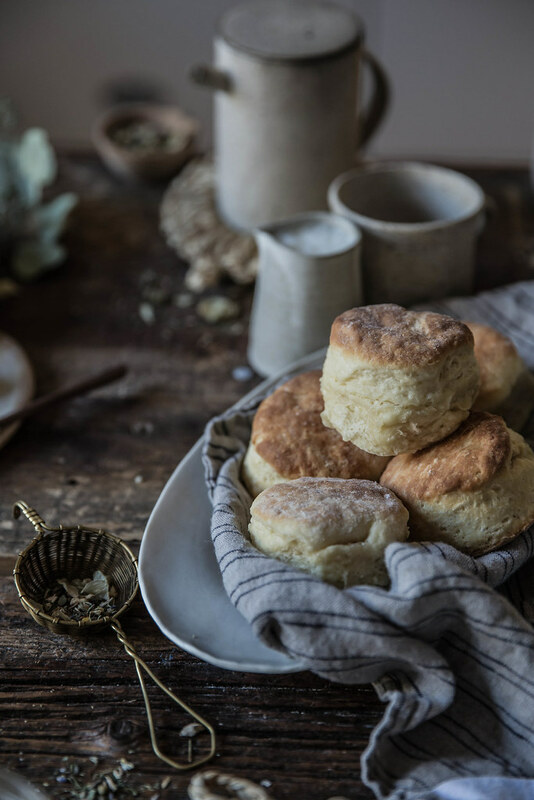 I have to admit that I’ve never been one for buttermilk biscuits but after seeing these, you may have changed my mind – they do look delicious. Perfectly put, as usual. 2014 was a fiery year for us, and now I will forever think of it as our phoenix year. Hoping 2015 holds much learning, beauty, joy, and peace for you and yours. Thank you for the time you put into your recipes, photos, and especially writing. I look forward to it always. The rise on those biscuits! Swoon. Happy New Year! 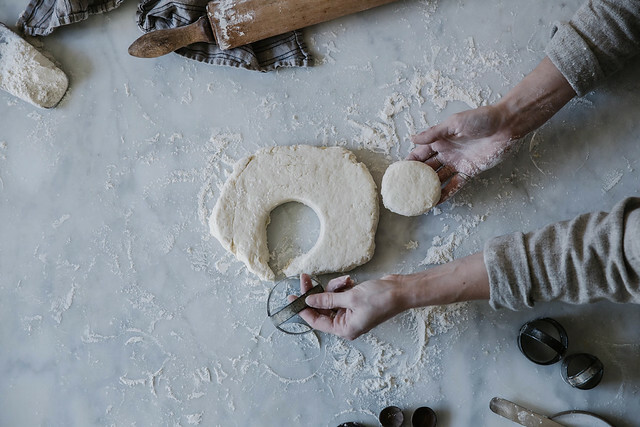 From scratch biscuits like this are the absolute best! Yum! they sound amazing! simple is often best. These biscuits look delicious! What beautiful photography! Venice is one of my favourite cities as well. I hope you have a lovely time. Happy New Year! Well, this is certainly a recipe I have to try! 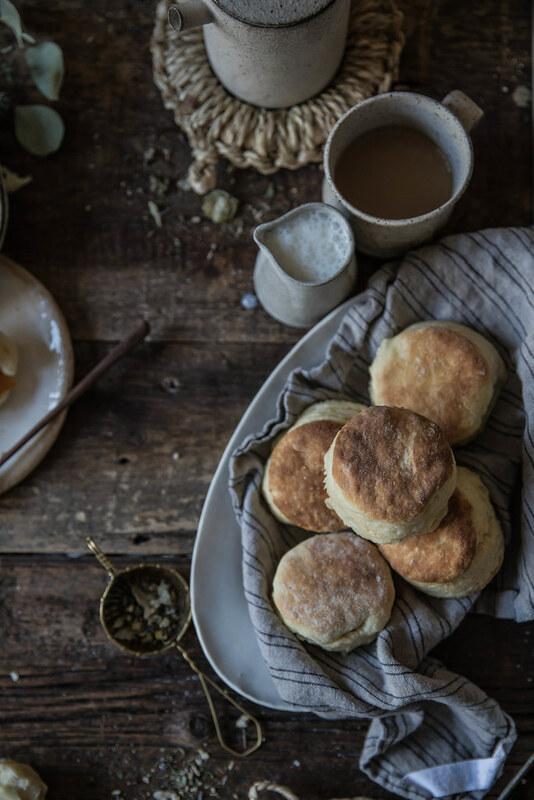 Southern buttermilk biscuits are something extraordinary, and I just know that I’ll love your recipe. Hope you have a wonderful time in Venice! I would have loved to attend but just couldn’t fit it into my schedule. Maybe one day! Safe travels and a 2015 full of travels, inspiration, love, and friendship. Scones are my Ouma Verona’s speciality. I miss her when I look at these pictures. They’re beautiful! I found your blog and started following your Instagram since last year. I have to say I’m falling love with your photography. They are so beautiful!! Thank you for inspiring me. I am so profoundly thrilled to have discovered your blog !!!! through the magazine Where Women Cook just yesterday!!! Amazing article about you!!! I am an intuitive and I am a stylist and chef at heart!!! You inspire me!!! I would love to know more about your workshops!!! How I might sign up to attend??? You see, you are just what I have been searching for in my life!!! So interesting. Such beautiful pictures! I didn’t have my first biscuit until last year, and when I did, I fell in love. I still have yet to make them. I loved reading your observations and reflections about your year- I hope 2015 brings you just as many brilliant moments as 2014. Safe and happy travels to Venice! i made these over the weekend, using lactose free milk and ghee and it was divine. thanks for sharing. Such a simple and wonderful recipe!! And gorgeous pictures! Delicious words Beth. And I really want to eat those biscuits with ham right now! Your words are just as beautiful as your photographs, Beth! Best of luck in Italy, I’m looking forward to seeing all the beautiful things you capture while you’re away. Happy 2015! It is amazing to see the differences in your photography and ingredients used from a biscuit post from April 2012 to January 2015. Love your work! It is an inspiration to me! I love your gorgeous styling! 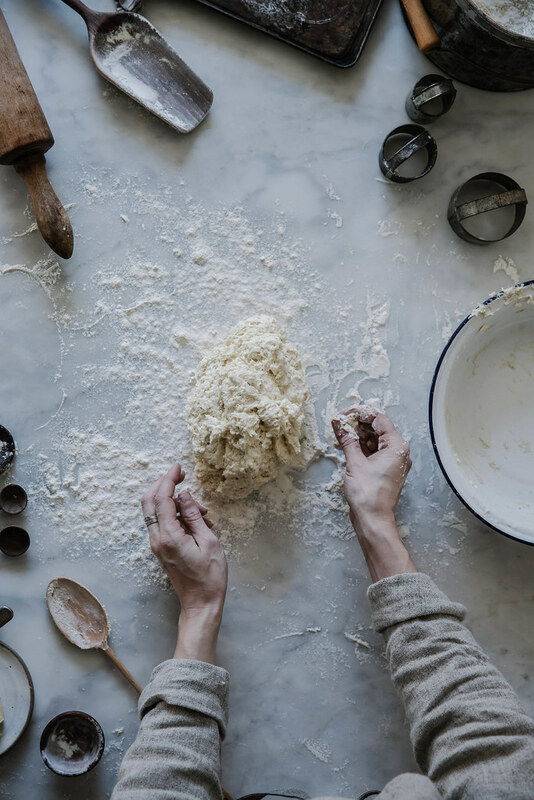 This is such a lovely post, I must try to experiment with this recipe and make it plant based. I hope you open up more food styling workshops in 2015! I would love to join! Happy new year Beth. Beautiful biscuits. Such a classic.. Wish you safe travels to Venice. PS The recipe looks insanely good and I want to make these tonight! These look like the most perfect, fluffiest biscuits ever. Have a great trip! Traveling for work, I can only dream of that right now. Beautiful words. 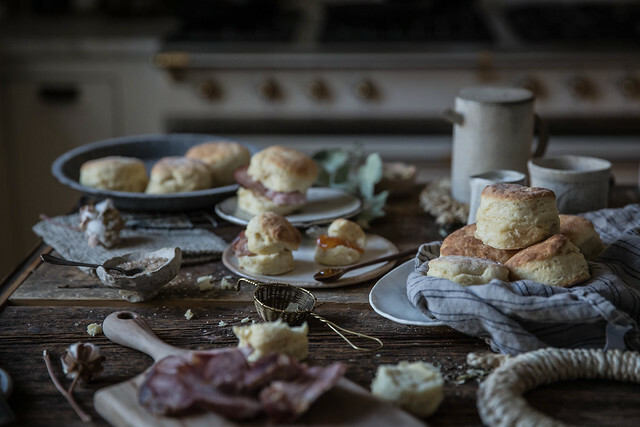 Eating your biscuits + ham sounds like my kind of party! Happy New Year, Beth. This, and the lavender cake are the first two recipes I am going to try and I will leave you feedback for both. I love your blog, I love the depth, the purity, the sensuality and the hardwork that bursts from every page of it. Truly true and inspirational. PS: where do I look for a large marble board like that? This is EXACTLY the recipe that I use! I tweaked my mama’s recipe, since she uses self-rising flour and regular milk, but this is it. It really is the best one out there. Thank you for the recipe, as I read it I realized this was the way my Italian god mother taught me to make biscuits 45 years ago. Wish me luck. 4am here. staying cozy by the fire. Rested but ready to get the day going. Hubby and puppy are still upstairs asleep in their cozy bed covered with quilts as the heat is out for a day or so. 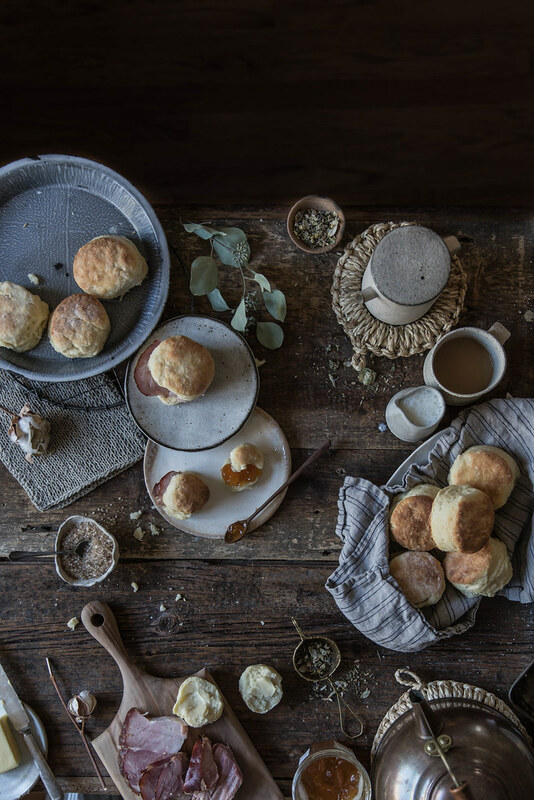 Biscuits may be on the table this morning…the recipe is simple and the experience seen through the photographs feels earthy, taking me back to a simpler time. The farm table caught my eye. I found one almost identical two years ago. It is well made but well worn. I have never sanded it, or repainted it. It’s beauty is in its deep multicolored grains and imperfections. The utensils used are also from bygone days. I feel that we share this in common. When I come across items like this in sales, stores, etc..I stop, look, touch, savor all of the memories of a lifetime of use. Then I buy, bring home, and carefully find a place for them in their new home. Thank you for your exquisite work! I will join you in your travels..stay warm, stay safe, enjoy and revel in every moment. I’m new to your blog. This is beautiful photography and one of my favorite things to make. You’re right, biscuits are an art. 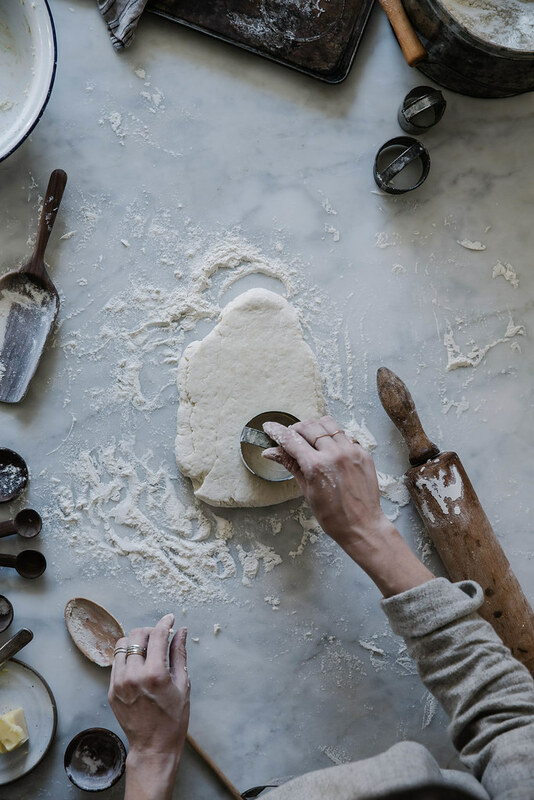 They have a feel, no matter what the recipe – cut or drop, buttermilk or sweet – that you only get to know through repetition. I look forward to making these for my family tomorrow for breakfast. Thanks for posting. Just made a batch of these lovely biscuits and they are wonderful! Thank you for sharing this recipe. Ever since moving to the south 3-1/2 years ago, I’ve been searching for the best biscuit recipe. This is it. 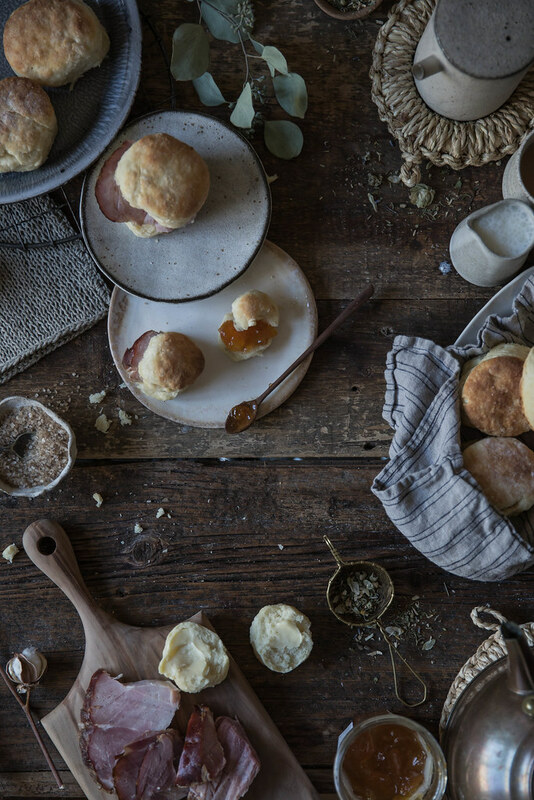 Simple to throw together, the biscuits rise beautifully and taste amazing. The folding and rotating is crucial -creating the most amazing layers. I’ve been buying local full-fat buttermilk by the half gallon for the sole purpose of making these biscuits. Thank you for sharing. My class are going to making biscuits and I want to know is it HARD ! I was searching for a recipe with nice, even measurements and yours delivered! Although the “scant” 1 up could have been tricky. Fortunately, I own a digital scale and so measuring 230 grams was easy. Well…biscuits are just out of the oven. Time for a taste! Hello! Funny how the simplest recipes are sometimes the best. I made your biscuits and this will be my biscuit recipe from here on out. Thank you! Your biscuits are out of this world and I thank you for this recipe. Also your photographs and your lovely thoughts as you go along life’s path. I am old now, but I am always trying out new and delightful recipes. This will go in my favorite place for my children to find when I have moved on to high places. Have a wonderful new year. Really amazed by the photography. I thank you for this recipe and gonna try it now. Great Blog! My husband and I absolutely loved these biscuits; thank you for sharing. Last week we had them for breakfast with butter, marmalade and honey, but today I am using the same recipe with a teaspoon of ground cardamom (from the pods) added. I think the hint of spice will be a savory compliment to lamb pops. Feeling excited! Lovely to recipe. One of the best biscuits I ever had. I put this recipe of biscuits on top of a chicken pot pie instead of a crust and it was sooooo yummy. Thouroughly enjoy everything about your site! I made biscuits for the first time with this recipe, and they were delicious. Thanks for making your recipes so simple and approachable! I feel so dumb… I can’t find the actual recipe. Help? Not dumb! It was missing due to errors by our web host…it is there now! I love this recipe so much. Has anyone tried to make these ahead and freeze them? Not sure if that’s even an option, I just want to have them all the time! Never tried it! Maybe? Worth a shot! Maybe google freezing biscuits? I very much enjoyed reading your post. I was looking for easy and amazing biscuit recipes for my 3 kiddos. You reeled me in with your brilliant and witty writing. 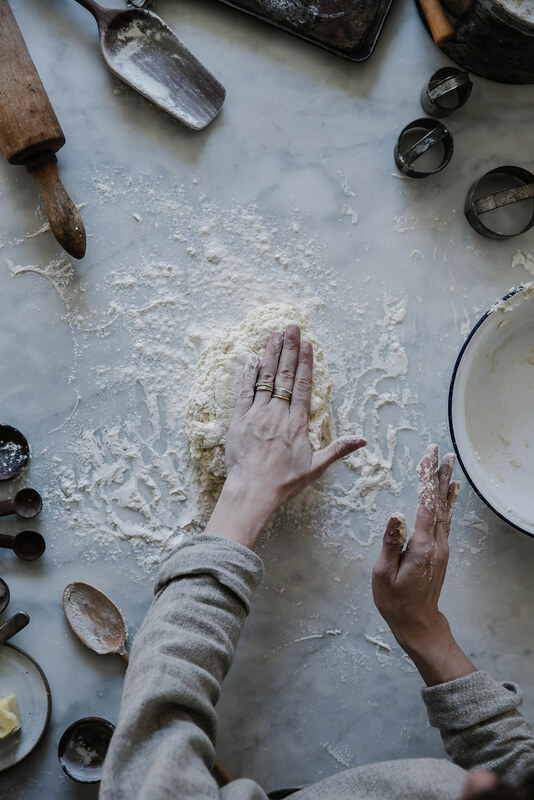 I rarely read a whole post as I get annoyed, but yours…writer and baker/chef! This is an old post for you, so I still hope that you are at it!